There is lack of Government and Corporate transparency everywhere and in recent years it has enraged people at times and created much resentment among the masses. 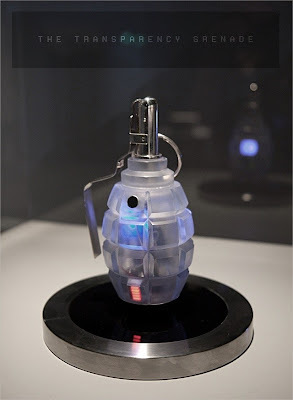 As a protest against these practices, The Transparency Grenade project has been created by Julien Oliver and is currently being on display at Weise7 exhibition in Berlin. 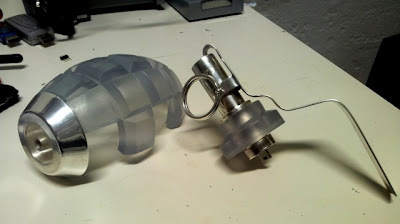 TG is a replica of Soviet F1 Hand Grenade. Though it looks like a bomb, its rather an ARM based computer running Linux. The device includes a microphone, a powerful wireless antenna and a battery. When the plug is pulled, it captures network traffic and audio at the site and securely and anonymously streams it to a dedicated server where it is mined for information. Email fragments, HTML pages, images and voice extracted from this data are then presented on an online, public map, shown at the location of the detonation. The metal parts are hand-crafted out of sterling silver complete with operational trigger mechanism, screw-on locking caps and engraving. Of course this device is not created so that it can be used publicly. It has been made to increase awareness and make a statement against the fishy Government policies where there is no transparency. Plus the Grenade design is not suitable and will rather get lots of attention. The computer runs a modified Angstrom OS, a GNU/Linux embedded operating system popular on ARM devices. Many people think its a great project and it should be used. So after many requests and a generous donation, an Android application is being made which will run on rooted devices. This will mimic some of the functionality of the grenade, with the TG program running 'invisibly' on the phone as a background application. A GUI will be provided for configuration. Due to legal concerns the author will not provide a server for using this application. However, all code will be published for study and so that others can set up their own service, should they find a worthy need for it. Check out more details and screenshots of the device from official website.